May 10, 2009, WASHINGTON, DC - The National Transportation Safety Board has determined that the probable cause of a midair collision between two emergency medical service (EMS) helicopters last year was that both pilots' failed to see and avoid the other helicopter on approach to the helipad. Contributing to the accident were the failure of one of the pilots to follow arrival and noise abatement guidelines and the failure of the other pilot to follow communications guidelines. 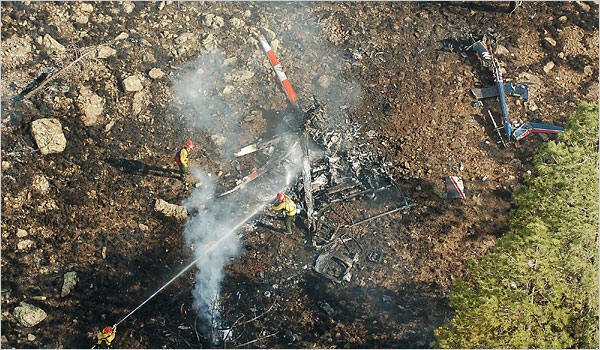 On June 29, 2008, about 3:47 pm MST, two Bell 407 EMS helicopters, operated by Air Methods Corporation, and by Classic Helicopter Services, collided in midair while approaching the Flagstaff Medical Center (FMC) helipad in Flagstaff, Arizona. All 7 persons aboard the two helicopters were killed and both helicopters were destroyed. "This accident highlights the importance of adhering to the regulations and guidelines that are in place," said Acting Chairman Mark V. Rosenker. "Had these pilots been more attentive and aware of their surroundings, and if communications would have been enhanced, this accident could have been prevented." In its report today, the Board noted that both EMS helicopters were on approach to the Flagstaff Medical Center (FMC) helipad to drop off patients. During the flights, both pilots had established two-way communications with their communications centers and provided position reports. The FMC communications center coordinator advised the Air Methods pilot that there would be another helicopter dropping off a patient at FMC. The FMC coordinator also advised Classic communication center that Air Methods would be landing at FMC, but the Classic communication center did not inform the Classic pilot nor was it required to do so. However, the Board stated that if Classic's pilot had contacted the FMC communications center, as required, the FMC transportation coordinator likely would have told him directly that another aircraft was expected at the helipad. If the pilot had known to expect another aircraft in the area, he would have been more likely to look for the other aircraft, the report stated. As documented in the report, Air Methods did not follow the noise abatement guidelines, to approach the helipad from a more easterly direction. Classic approached the helipad from the northeast, and it is likely that the pilot would have been visually scanning the typical flight path that other aircraft approaching the medical center would have used. Thus, if the Air Methods helicopter had approached from a more typical direction, the pilot of the Classic helicopter may have been more likely to see and avoid it. Neither helicopter was equipped with a traffic collision avoidance system, nor was such a system required. Had such a system been on board, the Board noted, it likely would have alerted the pilots to the traffic conflict so they could take evasive action before the collision. However, according to Federal regulations, ultimately the pilots are responsible for maintaining vigilance and to be on alert and avoid other aircraft at all times.